Google is retiring the Ecommerce Platform Import feature with BigCommerce, PrestaShop, and Magento on March 20, 2018. The majority of ecommerce store owners on these platforms weren’t taking advantage of this feature, which likely led to this decision. For those using this feature, never fear: you still have plenty of options. The other feed importing options include syncing your feed using an XML URL, through a Content API (platform supported apps), Google Sheets, and even the Manual Upload method. These methods are all as effective and easy to use as the Ecommerce Platform Import. With this many options, its evident that the retirement of the ecommerce integration feature is no real loss. If you’re worried about real-time product updates, the other options perform just as well as EPI. The XML URL and Content API options communicate with your store and the Google Shopping Feed in real-time to automatically sync product info such as stock level, latest prices, etc. automatically. Even Google sheets can be scheduled to freshen your shopping feed daily, weekly, or monthly. The only method that does not update your product information in real-time is manual uploads with a CSV or TXT file. We recommend the XML URL method in BigCommerce because it has proven easier than any of the other methods. Within a couple of clicks, you can generate a feed URL of your all of your store’s products. Once you have that, it’s very simple to add this XML URL into Google Merchant Center and add your feed to Google shopping. 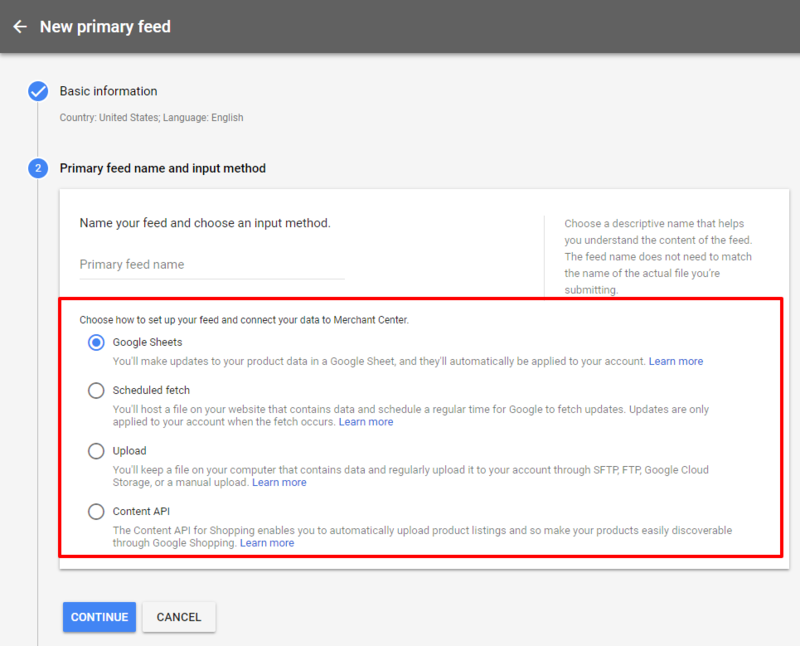 This will allow the feed in your Google Merchant Center account to directly sync with your store and update products based on your schedule, which you can define. 3-Click fast and easy feed setup. XML URL automatically syncs with your store and Google Merchant Center. Product errors can easily be discovered and fixed. The XML Feed URL is also accepted by Bing, Facebook, and other advertising channels. We get it – this is a pretty big change, and implementing a new feature can be daunting. That’s where we come in: we have a team full of experts who are well versed in the execution of this transfer, and are well equipped to help you! We have a full suite of digital marketing and web design services as well if you’d like to give your brand a boost. Give us a call at 310.928.6472 or fill out our contact form to see how we can help.